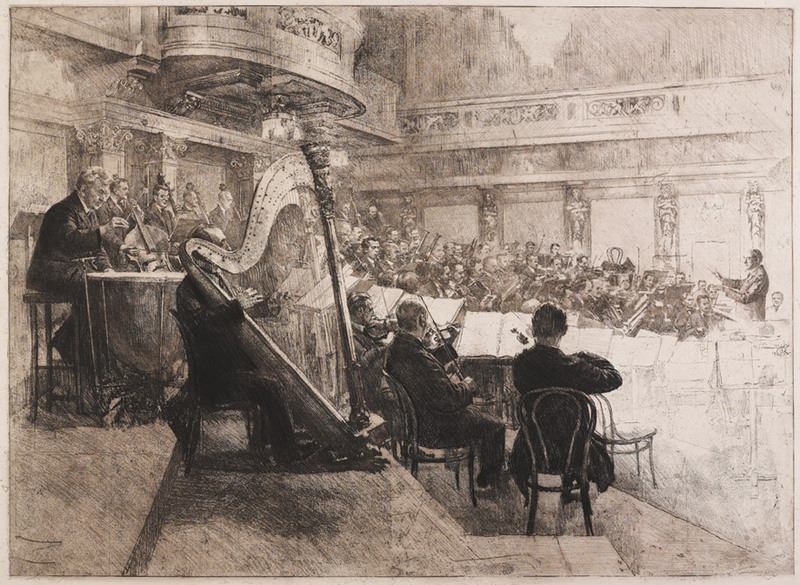 Since 1842, the year the Vienna Philharmonic was founded, our country has experienced not fewer than five extremely different forms of government and sometimes suffered for it, as well as the fall of a 600 year-long world empire and two world wars. It is by no means certain that an institution would be able to hold onto its founding principles or continue to maintain them for more than 170 years. Respecting this sort of historical setting and considering a world changing faster than ever, it is even more astounding that during the Vormärz era an idea was realised by composer and conductor Otto Nicolai and the former orchestra members of the Imperial Royal Court Opera next to the Kärntnertor that has also proven itself to be relevant in the 21st century. An additional factor is undoubtedly the amount of exceptionally multi-layered intensive compilations of numerous members in the most varied areas of music: composition, teaching, music history, music theory, sociology of music, etc. An essential aspect of the “philharmonic sound” is the efforts to preserve and further develop the specific instruments that the orchestra uses. In addition to the Vienna oboe and the Vienna horn, which are also the most internationally famous exponents of the “philharmonic sound”, the timpani was and is the subject of permanent development, the journey, which was begun by a name relevant to music history: Hans Schnellar (1865-1945), born in Bohemia. In 1894, he was employed by conductor Hans Richter (1843-1916), the legendary conductor of the premiere of Richard Wagner’s “Ring des Nibelungen” in Bayreuth, at the Royal Vienna Opera and was the timpanist in the opera orchestra as well as at the Vienna Philharmonic until 1932, and taught at the Conservatory of the Society of Friends of Music and at its successor, the Academy of Music and Performing Arts from 1908 until 1932. Schnellar worked with scientific meticulousness on the technical development of his instruments: supported and encouraged by the Royal Opera Director Gustav Mahler as well as State Opera Director Richard Strauss, he worked on technically improving the instruments and in 1920 applied for a patent for the invention of a timpani operated with a hand crank. When he was appointed as the chief conductor of the New York Philharmonic (1909), Gustav Mahler coordinated the purchase of two pairs of Schnellar timpanis (and additionally tried to convince Schnellar to accept a job offer in his current orchestra). Schnellar’s hand-crank timpanis also proved themselves to such a high level in the works of Richard Strauss that the master even allowed him to change the timpani composition at one point in “Sinfonia Domestica” in order to use the instrument thematically. In the succession of timpanists of the Vienna Philharmonic, beginning in 1842 with Anton Hudler and Alois Blacho, including 21 musicians to this day, Schnellar has a prominent position, simply due to the productive discussion with Mahler and Strauss. That impetus with which he dedicated to developing his instrument lived and continues to live on in the orchestra: Richard Hochrainer (1904-1986) was not only employed as a teacher, he also continued developing the Viennese timpani, as did Wolfgang Schuster (* 1942), who was part of the State Opera Percussion section from 1961 to 2005. The tradition of developing instruments is now in the hands of Anton Mittermayr (* 1970), who has been the timpanist in the State Opera Orchestra since 1996, and since 1999 has belonged to the Philharmonic Association.